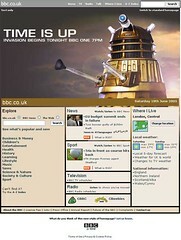 I wrote the other day about the audience feedback we had received to our Dalek special homepage. By Martin Belam on 23 June 2005. Did anyone notice on Saturday 15th October on Casualty the woman who had supposibly been dead for 7 hours BLINK!!! eery or what???!!!!!!!!!! !